This is a commission slot. You can hire Bo_draws to create a personalized artwork of this sort here. The artist will most likely respond to a request within 1.9 days. This commission slot was rated positively by 7 clients thus far. Portrait of semi-realistic character with details. I'll be happy to draw your favorite characters from any fandom or from your original stories! You're getting a full resolution picture and the right to use it, but NOT to resell it. Second commission I've gotten from them and still can't get over how amazing this artist is. Artist is a great communicator and well worth the commission, have used multiple times now. Quick response time and beautiful work! Wonderful artist, very prompt and easy to work with! Absolutely gorgeous artwork in a reasonable amount of time, will definitely be commissioning this artist again. Very communicative, responds to feedback quickly and positively. Provided everything I wanted, and more. Would gladly work with again. Drew my character brilliantly! Got the expression perfect. Very talented! Was patient with minor adjustments an finished early. Worth the money. Would recommend. Love the result and how it almost looks like a portrait to hang on the wall. I love it! As a frequent user of this site, this artist is worth every penny. Quick work with amazing results 10/10 would recommend. Stunning realistic work. I enjoy working with this artist! Bo is amazing! Another great portrait. I will be back again!! I'm a returning customer. This artist is super talented, I'm so amazed how they successfully interpret my description and produce the most perfect illustration. I strongly recommend! This was an amazing piece to receive! Worth every single penny! Bo_draws is such a talented artist, and gives you *exactly* what you ask for. 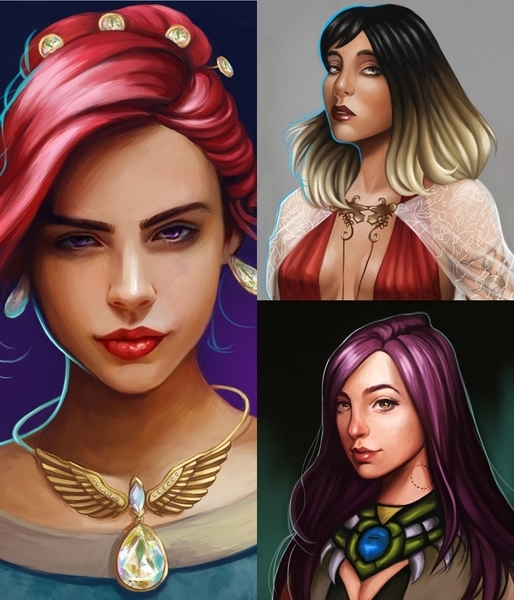 If you need a RPG character portrait, I highly recommend Bo_draws. Absolutely stunning art, and was pleasant to work with. Requests for adjustments were taken right to the very end. I am absolutely amazed by the end result! Such a lovely, talented artist. 100% recommend. Bo is AMAZING. Probably the best artist on here. Twice now, I'd had a piece done by Bo and each one have been nicely done. I love the quality! Would recommend and consider yet another piece. While a little bit late on the deadline, the job was taken during the holidays and that's totally understandable. I'd absolutely work with them again and the portrait I got was fantastic. I'm super happy with Bo_draws and their work. I was absolutely blow away with the artwork. Will gladly have a commission done again. Bo was amazing. Not only was the artist incredibly patient during the process, as I have never used the site before. But, the artwork is stunning. Excellent attention to detail as well as fast and communicative. Pleasure to watch you work. A great drawing and a very nice artist to work with! very fast turn around, love the result! Second commission and it turned out great like the first! Incredible quality. Amazing artwork. Will definitely commission again! Great artist. Fantastic work. Highly recommended! Always a reliable and dependable product at a great price! Always a wonderful experience working with this artist! responsive to feedback. definitely recommend. Fantastic to work with, and fantastic product, as always!